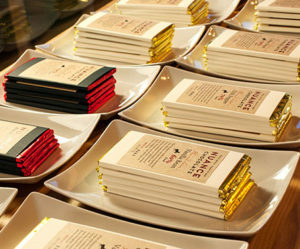 What’s better than local handmade chocolate? How about local handmade chocolate and electric vehicles (EVs)? 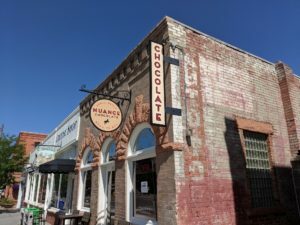 Toby Gadd, President and Co-Founder of Nuance Chocolate in Old Town Fort Collins recently decided the future had finally arrived and it was time to electrify his daily transport needs. After doing a bit of research online, he decided that the 2016 Mitsubishi i-MiEV was the right price and would meet his needs for getting around Fort Collins. You don’t see many i-MiEVs around Fort Collins, so DENC was eager to talk with Toby and find out about his experience with the vehicle. DENC: What led you to first considering buying an EV? Toby: When I bought my first brand-new new car years ago, a 1989 Toyota pickup, I expected that it would be my first AND last internal-combustion engine. I figured that automotive tech was evolving quickly enough that my next car would be something clean and futuristic. It only took almost thirty years—but we finally have that car! DENC: What factors made you choose the i-MiEV over other EV offerings? Toby: Earlier this year, my wife Alix and I came across an article in the media discussing EVs. They mentioned that a quirky little off-beat child of the EV revolution could be purchased used for around $6000. That car, of course, was the i-MiEV. We started looking into it, and found that they were indeed inexpensive, reliable, safe, highly-functional, and weirdly cute. Some of the reviews were less than stellar—but it seemed like they were really trying to make the i-MiEV into something that it wasn’t intended to be. I found a great forum, MyiMiEV.com, full of passionate owners who understood what the car really is all about, and we were quickly convinced that we needed one. DENC: What are your charging habits like? How often do you charge at home/work/in public? Is charging time ever an issue? Toby: We charge at home every day or two. We’ve never had an issue with charging time. Our i-MiEV has the fast-charging option, but we haven’t needed to use it yet. DENC: What aspects of the i-MiEV do you value the most? Is the 62-mile range ever an issue? Toby: We love its simplicity and focus on functionality over glitz. It simply gets us from point A to B, with very little fuss—without using a drop of fuel. It’s surprisingly roomy for such a little car, so, in addition to being our commuter car, we use it for many of our local recreational outings. Range is a limitation, but we still have our two ICE vehicles for longer trips to Denver and to the mountains. DENC: Does your EV provide you with any special value as a small business owner? Would you recommend an EV to other small businesses in Fort Collins? Toby: Like many other small-business owners, we frequently make small trips—and the i-MiEV is perfect for those. We also feel very good about not contributing to the Front Range brown cloud. As business owners, we do feel compelled to live by our values in every way that we can, and the i-MiEV helps us do just that. DENC: Any other thoughts you’d like to add? Toby: The EV revolution is here, and it’s clean, reliable, inexpensive, and fun!